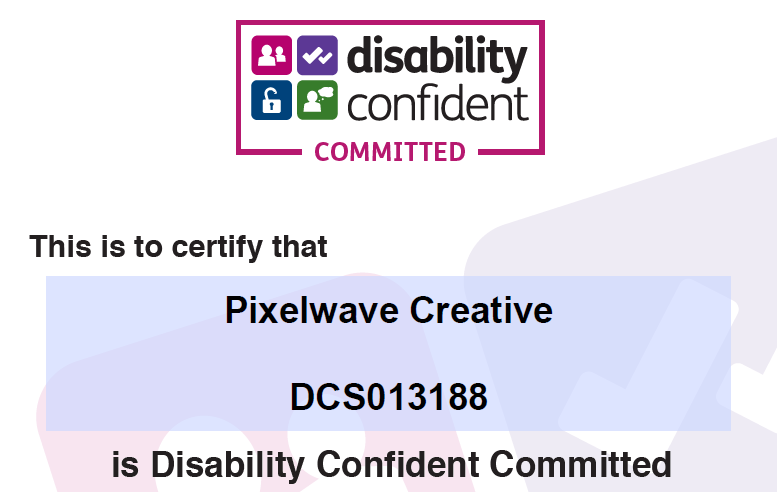 Pixelwave Creative is proud to announce it is a ‘Disability Confident Employer’, a status given to organisations that strive to make the most of the talents disabled people can bring to the workplace. We have been awarded the accreditation through a government scheme that supports employers who want to improve how they attract, recruit and retain disabled workers. To achieve the criteria for Disability Confident, Pixelwave Creative was required to undertake a self-assessment against a set of statements. Through these, we demonstrated a commitment to ensuring our recruitment process is inclusive and accessible. We also support any existing employee who acquires a disability or long-term health condition, enabling them to stay in work. View our Disability Confident status here and find out more about the accreditation.